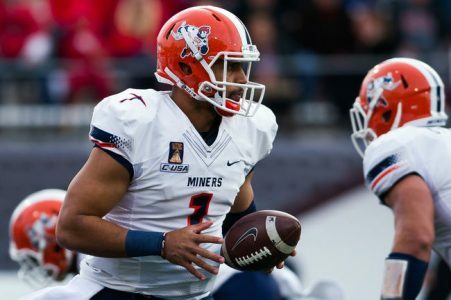 Play On: UTEP Miners +10 1.1* Free Play. New Mexico Bowl game between UTEP and Utah State. Normally I would back Utah State a team that in years past has been dominating on defense but right now there is just something missing as their defense gave up 900 yards rushing and 8 TD’s over their last 4 games combined. UTEP’s Aaron Jones has the play making ability and I don’t view Conference USA that far behind the Mountain West. In fact I rank the Mountain West 6th, and C-USA 8th. UTEP had the tougher non-conference schedule facing Texas Tech, Kansas State and no FCS team while Utah State faced Tennesse and Wake Forest + FCS team. Each team had one common opponent which was New Mexico. New Mexico is another team that runs first and UTEP went on the road and beat them 31-24 while Utah State won at home 28-21. I just think there is too much value here with UTEP who is very excited to be in this bowl game. The total in this game is also dropping like crazy and is now down at 44 which makes this 10 points all the more valuable. UTEP is 2nd in the nation in time of possession, they have only turned the ball over 11 times, and they are among the best in fewest penalties ranking 23rd while Utah State comes in at 103. If that’s not enough for you, UTEP starts a senior QB and an experienced secondary while Utah State is starting a freshmen in Kent Myers. Sure Kent Myers is 4-1 as a starter but the pass defenses he has had to go up against are some of the worst in the nation in Hawaii, Wyoming, New Mexico etc. UTEP is ranked 10th in passing defense efficiency. UTEP is also better on third down offense and defense and again I still don’t think they are in a far worse conference. Don’t forget my BOWL DISCOUNT PACKAGE – I am current #1 long term COLLEGE FOOTBALL Handicapper! I’m +56.48 Units This year and 332.98 Units in my career on a 1-5 Unit Scale!